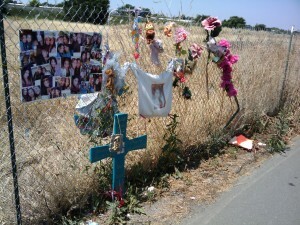 Roadside Memorials – Filling in for the Church? People make these as a way to express their grief and feel like they’re doing something about their loss. The church used to provide a place for that. We used to be the place where people gathered to express their loss and comfort each other. A memorial service followed by a reception used to be the place where people would find meaning and hope in a senseless loss – where people could share their pain, share their stories,comfort one another, and offer support. If we wanted a lasting memorial to a person, we would donate to the church’s memorial fund and our loved one’s name would be recorded where future generations could read it. But where do you go if you don’t have a community like that? How do you find hope if you don’t have the hope of the gospel? Where do you go to share stories? I think that these roadside memorials are a sign of spiritual hunger – of people’s search for meaning and longing for more in life. We’re desperately trying to create it for ourselves. I wonder how the church might respond. I wonder if there’s a way for us to meet that need again the way we once did. I wonder if we could make ourselves available for memorial services or even places to memorialize someone in a more permanent way. How could we let people know that we’re there for them in their time of crisis?